DEARBORN – Around 4.3 million Michiganders cast their ballots on Tuesday — more than 1 million more than the last gubernatorial election in 2014 — a surge that pushed voter turnout beyond levels seen in five decades. In 2014, 3,188,956 ballots were cast. Statewide turnout among registered voters was 57.5 percent — much higher than 2014’s turnout of 42.8 percent. Political observers have attributed the spike in voter turnout throughout Michigan, as a response to the election of President Trump. Even though he wasn’t on the ballot, Trump’s policies and rhetoric helped drive up turnout, Jonathan Kinloch, chair of the 13th Congressional District Democratic Party, told the Detroit Free Press. “Over these past two years, it has come front and center that elections have consequences,” Kinloch said. Tuesday’s was the highest midterm turnout rate in Michigan since 1970, when it was 67 percent. The state record for a midterm election was set in 1962 with 75 percent. – Oakland County had the highest voter turnout with 64 percent. – Macomb County’s turnout was 59 percent and Wayne’s was 51 percent. – Detroit had a 41 percent turnout compared with 31 percent in 2014. – Leelanau County near Traverse City and Keweenaw County in the Upper Peninsula continued to post the highest turnout rates statewide during a midterm election year, 71 percent and 70 percent, respectively. – Dearborn’s city clerk reported 36,676 voters participated in this year’s midterm elections out of 67,646 registered voters, at 56 percent, which is consistent with the state average. In 2014 voters turnout was 41 percent, or 25,000 votes. 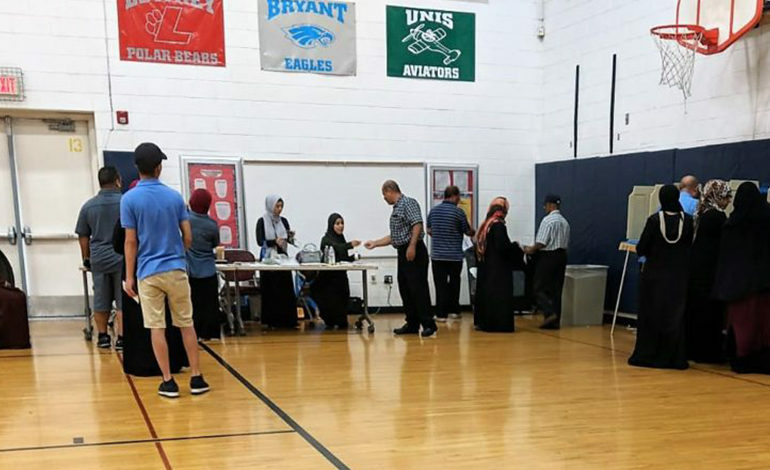 Turnout at one of the precincts with high concentration of Arab American voters this November election was at a record 41 percent high. The high turnout on Tuesday was forecast by voters’ strong showing during the August primary.